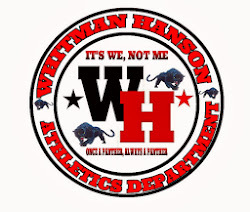 > Whitman Hanson had many personal best and state qualifying times at today's meet. Our sprint 4x100 team, Santos, Gillis, Braley and L. Nolan qualified with the time 51.9. Kelsey Tierney was a double winner in the 1 and 2 mile, qualifying in both. Sam Coletti finished 1st in 800m with a time of 2:13! Alex Santos placed1st in the 200 and second in long jump. Makayla Clemens won the javelin.